A smoke detector or smoke alarm is a device that detects smoke and issues an alarm to alert nearby people that there is a potential fire. A household smoke detector will typically be mounted in a disk shaped plastic enclosure about 150 millimeter (mm) in diameter and 25mm thick, but the shape can vary by manufacturer. Being an important aspect for fire safety, smoke detectors have been a major life saving device by alerting people to the danger of fire. Most smoke detectors work either by optical detection or by ionization, but some of them use both detection methods to increase sensitivity to smoke. Smoke detectors may operate alone, be interconnected to cause all detectors in an area to sound an alarm if one is triggered, or be integrated into a fire alarm or security system. Smoke detectors with flashing lights are available for the deaf or hearing impaired. A smoke detector cannot detect carbon monoxide to prevent carbon monoxide poisoning unless it has an integrated carbon monoxide detector. A residential ceiling-mounted smoke detector. Also seen in large rooms, such as gymnasia and auditoria, are projected beam detectors. A unit on the wall sends out a beam, which is either received by a receiver, or reflected back via a mirror. When the beam is less visible to the "eye" of the sensor, it sends an alarm signal to the Fire alarm control panel. Optical smoke detectors are quick in detecting slow burning, smoky fires. They are less sensitive to false alarming from cooking and bathroom steam than are ionization smoke alarms. Also known as uv flame detectors, this type is used to stop smokers from lighting cigarettes in designated non-smoking areas such as restrooms. It works by sensing UV light, so it is triggered immediately when a flame is lit. This is different from a conventional smoke detector which is triggered by sufficient levels of airborne smoke. In the early 1990s Texas A&M University did a full scale scientific investigation into the effectiveness of optical and ionization smoke detectors in different types of fires. The study determined that in a smoldering fire, with its relatively low number of large smoke particles, optical detectors fail 4.06 percent of the time, while ionization detectors have a 55.8 percent failure rate. For flame ignition fires, which have a large number of small, energetic smoke particles, ionization smoke detectors had a 19.8 percent probability of failure while optical smoke detectors have a 3.99 percent failure rate. In 2004, NIST issued a comprehensive report entitled Performance of Home Smoke Alarms - Analysis of the Response of Several Available Technologies in Residential Fire Settings. The report concludes, among other things, that "smoke alarms of either the ionization type or the photoelectric type consistently provided time for occupants to escape from most residential fires," and "consistent with prior findings, ionization type alarms provided somewhat better response to flaming fires than photoelectric alarms, and photoelectric alarms provided (often) considerably faster response to smoldering fires than ionization type alarms." 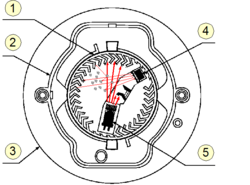 Smoke detectors are usually powered by one or more batteries but some can be connected directly to household wiring. Often the smoke detectors that are directly connected to household wiring also have a battery as a power supply backup in case the household wiring goes out. It is usually necessary to replace the batteries once a year to ensure appropriate protection. In new construction, most building codes today require smoke detectors that are wired to the main electricity flow of buildings. Many of these units also include a battery backup to ensure operation during a power outage. Rechargeable batteries should never be used in smoke detectors, since common NiMH and NiCd rechargeable batteries have a short life in between charges—in other words, they self-discharge relatively quickly. This is true even though they may provide much more power than alkaline batteries if used soon after charging (such as in a Walkman stereo). Also, a problem particularly prevalent in older technology rechargables is a rapid voltage drop at the end of their useful charge. This is concerning in devices like smoke detectors since the battery may transition from "charged" to "dead" so quickly that the low battery warning from the detector is either very brief, or may not occur at all. Virtually all modern smoke alarm units come equipped with a "test" button. Alternatively, artificial smoke can be purchased, which has the advantage of also testing the detection mechanism itself. Many people simply wave a lit match underneath the detector to test it, however this is dangerous as it can set the smoke alarm and the rest of the house on fire. A better way is to blow out a match or candle and wave the smoke under the detector. In the United States, most state and local laws regarding the required number and placement of smoke detectors are based upon standards established in Article 72 of National Fire Protection Association (NFPA) fire code. Detectors on the ceiling should be placed several inches away from any wall. If the ceiling is not flat, the detector should be placed at or near the highest point. If the highest point is a small recess, then the detector should be placed at the next highest level. Detectors placed on the wall should be several inches, but no more than a foot, from the top. Detectors should not be placed on a wall if the ceiling has a deep recess or if the ceiling slopes steeply or for a long distance. Detectors should be several horizontal feet away from a heating or cooling register, window, corner, the edge of a ceiling fan's sweep and doors to a kitchen or bathroom. They should be placed as far as possible away from combustion sources, like oil and gas-fired furnaces, space heaters, clothes dryers and water heaters, without compromising coverage or safety. 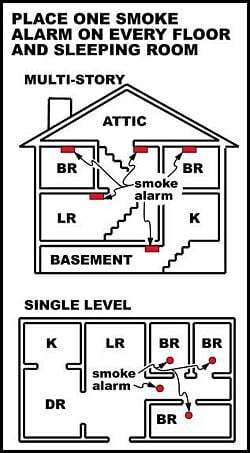 Smoke detectors in a basement should be placed at the bottom of the stairs and an additional detector should be placed in or near sleeping areas in the basement. Canada requires a building to have a working smoke detector on every level. ↑ Where there's a smoker there's fire Retrieved July 22, 2007. ↑ Skip Walker, Silent Alarms; Deadly Differences ASHI Reporter, June 2013. Retrieved June 16, 2015. ↑ Larry Grosse, The Results in Layman's Terms August 13, 1997. Retrieved June 16, 2015. ↑ NIST, Performance of Home Smoke Alarms - Analysis of the Response of Several Available Technologies in Residential Fire Settings Retrieved June 16, 2015. Air Force Inst of Tech Wright. Application of Smoke Detector Technology to Minimize Smoke Exposures to Wildland Firefighters. Washington, DC: Storming Media, 2001. ISBN 1423528360. Journal of Applied Fire Science, Volume 6, Number 2, June 1997. Risk Analysis of Residential Fire Detector Performance. NFPA fact sheet on smoke detectors. How stuff works - ionization-type smoke detectors. This page was last modified on 16 June 2015, at 20:24.